The 588U Universal Radio Holder from Aker is an extremely versatile holster, made from premium cowhide. It adjusts to accommodate almost all hand-held radios, allowing you to integrate it into almost any equipment loadout. 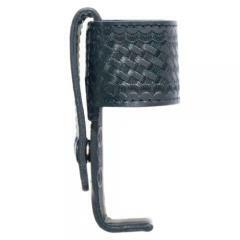 The wide top strap wraps around the radio to hold it in place, and is available in a plain black or basket weave finish. Most of the device is left exposed to reduce weight, but a steel-reinforced base support keeps it securely inside the holder. The rear strap attaches securely to the belt using a set of snaps, and fits a belt up to 2.25 inches wide.